If you were a ZTE phone user, one of the things you could come across is the accidental deletion of data on your phone. Android data recovery programs are designed to retrieve all the lost files from various Android smartphones and tablets. Regardless of any type of data damage, the software comes to help you in the recovery process. Data loss can be caused due to various causes, like virus attack, improper OS install, inappropriate SD removal and many more. Generally, if you backed up your phone, then you can restore from existing backups. If not, then you should user data recovery software instead. There are many backup apps and cloud services you can use to make a full backup of your ZTE phone. If you did this fortunately, then you can restore deleted files from previous backup without much effort. Restore from local backup: Open the program or app you used for data backup. Usually, there will be a restore feature as well as backup function. Click the option and select the location of backup file. It may be on your phone SD card or on a computer. Then select the backup file and click Restore tab. Then all the data will be pull back to your phone. Restore from cloud backup: The most used cloud backup option on Android phone is Google drive. You can backup contacts, photos, messages as well as other content on its server. Once you found the files being deleted by accident, then you can login your Google account and restore the data online. Without backup, you need to get user-friendly software, which works efficiently in recovering all the contents. Different tools have been discovered to assist you in regaining the damaged files. 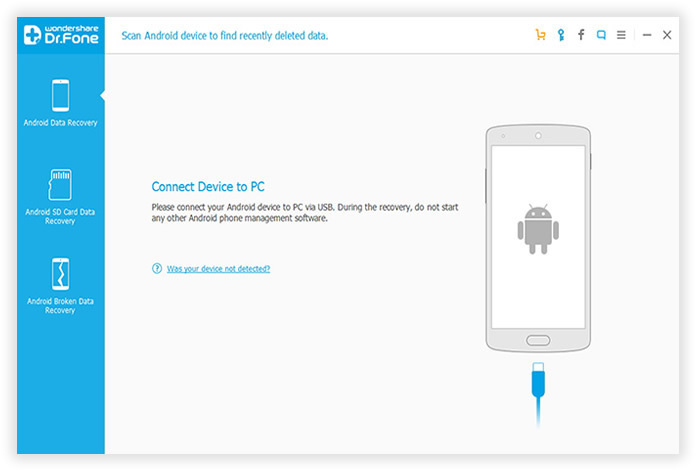 However, the most popular one for Android users is Androidphonesoft Android Data Recovery. Android Data Recovery enables you in recovering your ZTE phone data that has been lost for some reasons, such as unintentional deletion, screen damage or corruption of OS during the time of updating software. You have to go through only a few easy steps for getting back all files from the mobile. The software will scan the phone automatically for any lost files. When all the content is placed on the main UI of this software, you may get a separate preview of them to determine while the file is to be retrieved. Now, read these steps to recover your data with the tool. ZTE phone supported by this program: AXON 7/Mini/Max, ZMAX 2/Pro, AVID 828/Z GRAND/IMPERIA and many more. 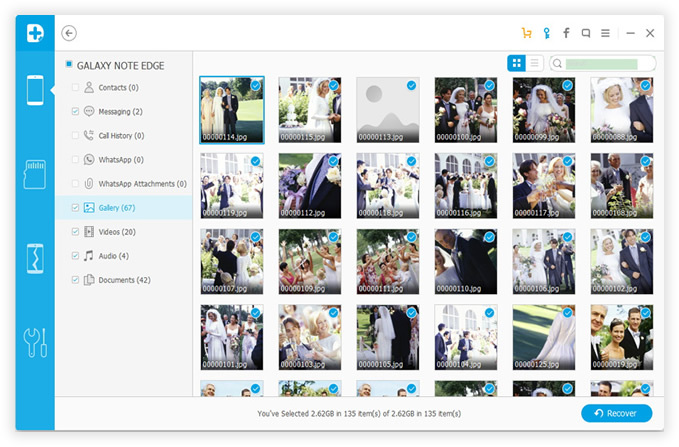 File type supported by this program: Contacts, SMS, Photos, Videos, Music, Call log, WhatsApp Messages and Documents. Simply click the download button to save the installation file on your computer. Then install it on a PC or Mac. Run the software after installing it. Make a connection of PC and your ZTE phone with the use of USB. After you have developed a connection of computer and Android mobile, you have to turn on USB debugging option. As per the version of your Android device, you may do it in different ways. 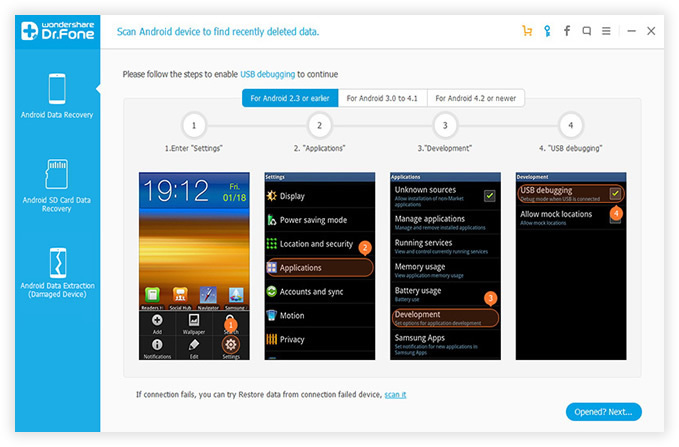 The following screenshot tells you how to enable USB debugging on different Android versions. Note: You should root the phone to ensure the process being conducted correctly. Without rooting, the program can't fully scan the whole device so the recovery would be partial and not complete. As soon as you have activated USB debugging on that phone, it will be identified by the software within a minute. After that, you can see a green option Start. 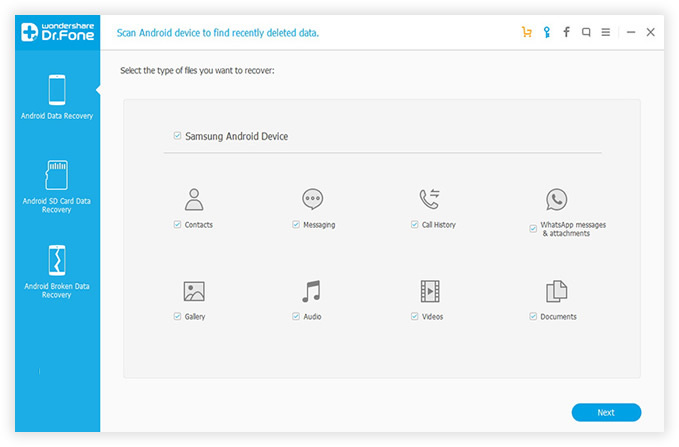 Click on this option so that the software may begin to scan the data of your Android mobile. An icon, indicating Allow may be seen on the interface. Then, keep your eye on computer screen. Choose Start option for continuing the process. Android Data Recovery is such a program, with the help of which you will be able to recover any kind of data, such as, contact lists, video files, images and SMS. After the files being scanned, you can have a preview for all of them. After that, the ultimate step is to check the name of files and give a mark only to those, which have to be recovered. Click Recover button at the bottom of the program and select a location to store the files on a computer. Now, your file recovery process is completed. Android Data Recovery is thus an efficient and safe program to get back lost data from all kinds of Android phones. To carry out the process of recovery with this software, you don't need any technical ability or special knowledge. Only give clicks on the right options. It does not matter, whether your messages and contacts are saved in HTML or CSV formats, all of them are recoverable with software. The documents, which are stored in XLS, DOC, ZIP or any other format, are also acceptable to the tool. You can also recover call logs, which include contact numbers, call duration all other details.